First Sunday of Lent (B): Do we want a savior or a superhero? 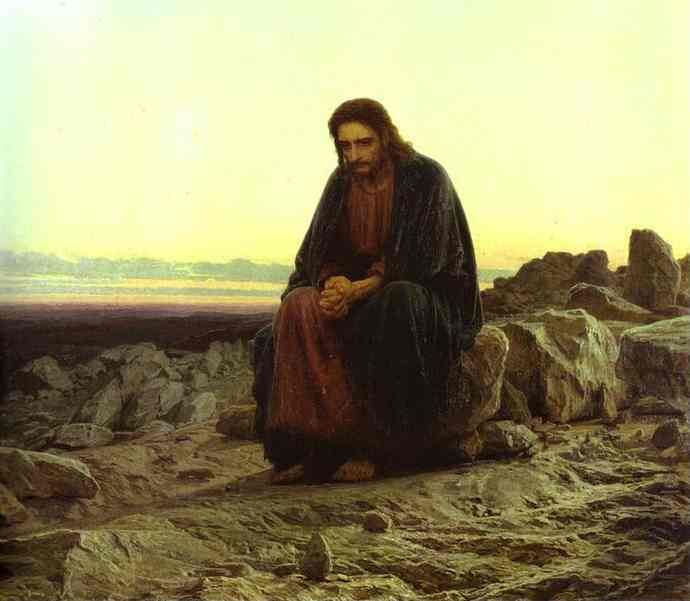 One of my favorite Lenten images is the painting “Christ in the Desert” by Ivan Kramskoy (pictured above). In the painting we have the “fully human” Christ. He does not have a halo. There is not a choir of angels around him. He is not is some majestic pose. Rather he sits alone in the hot desert. There is a weariness and fatigue to his posture. His shoulders are hunched and burdened. In his expression it is easy to see that he is lost in his own thoughts. The painting carries with it a sense of grave silence. 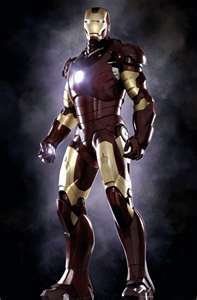 Iron Man (image to the right). This figure does stand in a majestic pose. He is all metal and strength. His eyes gleam forth in vision and leadership. His weak humanity is completely covered over by a suit of iron. This is the superhero who rights wrongs and triumphs over evil … or so we are told. But Iron Man is a myth and not a savior and Jesus is real and never pretended to be a superhero. If Christ is like us in all things except sin then he is not a man covered in iron but rather a man living in flesh and blood like all of us. He knew limits and weariness. He knew hunger and thirst. He experienced disappointment, fear, anger and loneliness. The whole gamut of human reality he knew even unto infinity as Pope Benedict XVI points out in his second volume of “Jesus of Nazareth” precisely because he experienced the full human condition in all its fears, uncertainties and limits without reverting to sin. The “except sin” of Christ does not shield Jesus from the fullness of the human condition; rather it leads him ever deeper into it. We are the ones who shield ourselves precisely through our sins. Our sins remain a running away from the human condition. Why not a superhero? Why not a man covered in iron to save us? and bodies which leave our breathless mirrors stunned. and weave community without the thread of need. that the best lives must be less than perfect. Today we sit in the desert with the savior Christ – human like us in all things except sin. He is not a superhero nor does he want to be. In the fullness of the human condition, the much “less than perfect reality”, he turns again and again to God and he binds himself to the Father’s will. This is what makes him both savior and brother to us. In his grace we are now invited to also bind ourselves to God not despite of but through our imperfect human condition and to be restored in relationship to God, to one another and to our very selves. Now, as always, we need a savior rather than a superhero. 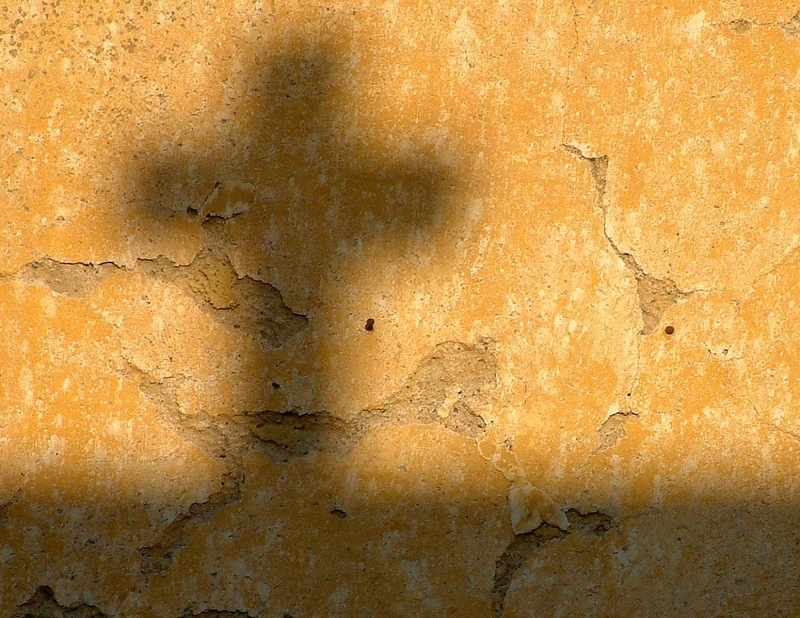 Today the Church begins the season of Lent – the time of preparation for the great celebration of Easter. I have not seen the movie “Joyful Noise” but I like this song. 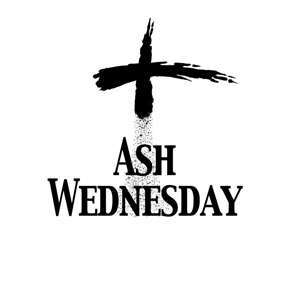 I have decided to keep it close to my heart this Lent. I would add “Fix Us Jesus” though as we are Church and we walk this journey of faith together. Seventh Sunday in Ordinary Time (B): Learning to welcome as Jesus welcomes! 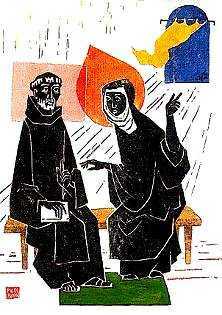 On February 10th the Church celebrates the feast of St. Scholastica – the sister of St. Benedict. There is a touching story told about this sister and brother. Once a year, Benedict would leave his monastery and Scholastica would leave her convent and the two would meet and spend the day together enjoying one another’s company and spending the time in spiritual conversation. Once, during a visit, their conversation continued on and on and the hour grew late. Noticing how late it was Scholastica asked her brother to stay and to continue their conversation until the morning. Benedict refused. He felt he had to return to the monastery. As her brother stood to depart, Scholastica joined her hands and bent her head in prayer. Immediately there was a flash of lightning, a mighty roar of thunder and the sky let loose a heavy downpour of rain that would not allow Benedict nor any of his monks to leave! At the heart of Benedictine spirituality is welcome and hospitality. In his Rule, Benedict urges his monks to recognize that when they welcome another, whomever that person may be, they are in fact welcoming Christ. This sense of gratuitous and warm welcome is witnessed by Christ himself throughout the gospels. In fact we could say that Christ again and again welcomes the other person throughout his ministry. Christ welcomes the poor fishermen and tax collectors as his disciples. He welcomes the public sinner, the outcast, the foreigner and the possessed. He welcomes the one who is ill and the leper. Again and again, Christ welcomes! One of the dynamics of today’s familiar gospel story (Mk. 2:1-12) – often illustrated in children’s Bibles – of the paralytic being lowered through the ceiling by his four friends is that Jesus warmly welcomes the man and his friends. “Child,” the Lord says with gentleness, “your sins are forgiven.” “These are words of forgiveness, a welcome that touches the foundations of our lives.” (Bishop Vincenzo Paglia) Our Lord could have just healed the man – being very efficient about the whole matter (an attitude prized so highly by our modern age) – and gone about the rest of what needed to be done. But he does not. Our Lord recognizes that the paralytic man is not just a “medical and social problem” needing to be solved but a child of God yearning and needing to be noticed and loved. Jesus acknowledges this and so he first welcomes the man; sharing God’s mercy and forgiving him of the sin that weighs him down and then he heals him of his physical ailment. We need to learn to welcome as Jesus welcomes. We live in a very cold and efficient age with many voices that encourage us to view the poor, the elderly, the foreigner, the sick, the disadvantaged as solely problems to be solved and problems best kept “out there” and “at a distance”. We need to resist these forces that seek to separate and divide (the modern day voices of the scribes who cannot fathom the healing depth of God’s mercy). It is not enough for a disciple of Christ to just help “at a distance”. We need to learn to welcome to the table; to welcome just as Jesus welcomed! And as we learn to welcome as Jesus welcomed; the one we may be saving might just be our very selves! Going back to the story of Benedict and Scholastica… Three days after their visit and the downpour of rain, Scholastica died. 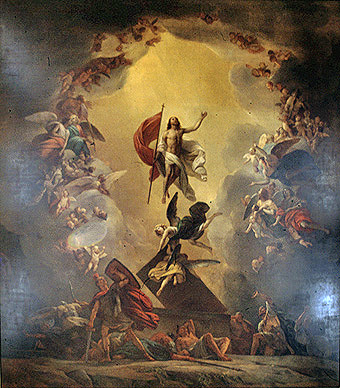 Benedict instantly is made aware of this by seeing her soul, in the form of a dove, ascending to heaven. At the time of their last visit, Benedict did not realize what little time remained but God knew that Benedict needed more time with his sister. Benedict himself needed more healing and comfort from the welcome, love and hospitality of Scholastica. As we learn to welcome as Christ welcomes we can help bring healing to others in a truly deep and abiding way and we can also allow healing to be brought to our own hearts. To begin my thoughts on this Sunday’s readings I would like to pull from the reflections of two men much more astute in Scripture and theology than I am. The first is Fr. Robert Barron. In the first episode of his Catholicism series, Fr. Barron focuses on who Christ is. The heart of the Christian faith revolves around this central compelling figure. Fr. Barron points out that in the time of Jesus the people of Israel were yearning for the Messiah and that the true Messiah would be known by some very distinctive qualities; one of which was that the Messiah would gather the scattered tribes of Israel. Jesus fulfills this quality but in his own unique way and not in the commonly expected way. Jesus gathers not by political or military might but by his power to heal. As we see in today’s first reading (Leviticus 13:1-2, 44-46) illness, most especially leprosy, in Jesus’ day carried with it the thought of God’s condemnation. The leper was cut off from the community of faith. 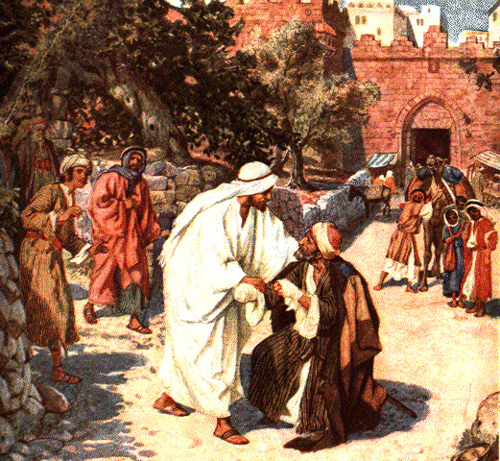 The leper must “dwell apart, making his abode outside of the camp.” Due to this exclusion the leper and all the ill were considered unclean and therefore unable to participate in the worship and ritual life of Israel. On a whole host of levels these poor people were removed and scattered from Israel even as they actually lived within the geographic and community boundaries of the people. Within the very midst of society they were isolated and cut off. The healing act of Jesus meant not just restored health for the individual but also restored relationship with the community! This is why Jesus in today’s gospel (Mk. 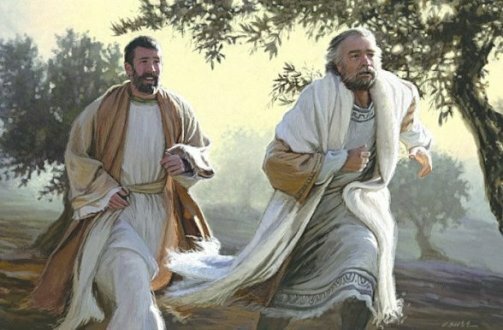 1:40-45) instructs the leper once he is cleansed, “…go, show yourself to the priest and offer for your cleansing what Moses prescribed; that will be proof for them.” The healed man is now restored in his relationship with the people of Israel. Jesus, as Messiah, is gathering the tribes of Israel; not through political or military might but through healing. Jesus, as Messiah, gathers in to full relationship the ones who are isolated and cut off and he does so by subverting the dominate force of fear through a movement filled with compassion and mercy. There are many lepers in our world today. There are many persons isolated, cut off and imprisoned in our very midst! They are isolated both by an imposed cultural fear from without and by their own fears and hurts within – the poor, the immigrant, the mentally handicapped, the elderly, the one who seems “different”. What are we to do? Be imitators of Christ! Not seeking our own benefit but that of the many! One of the benefits that we are all very good at holding very close to our chests and continually nurturing is the benefit of our own fears, our own prejudices and our own hurts. 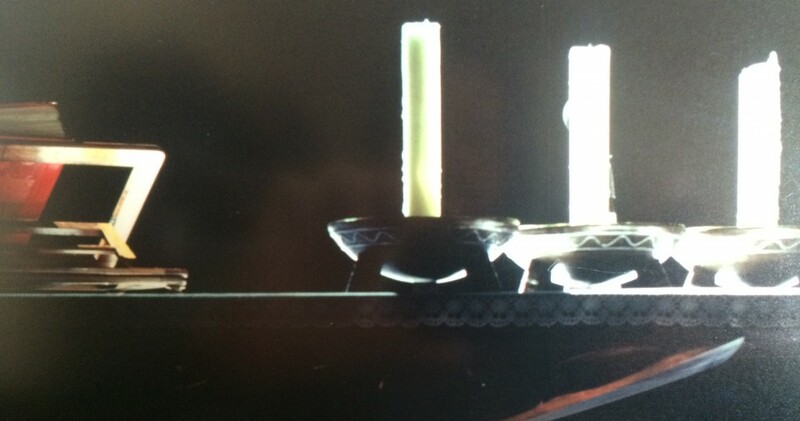 In the light of the gospel these must be exorcised. They must be let go of and released! We must be imitators of Christ in the truest sense – subverting the dominate forces of fear in our lives and our world through movements of compassion and mercy! This is what it means to be an imitator of Christ and what it means to be the Church; the Body of Christ in our world. This is the amazing movement of God’s grace – as we welcome the outcast in compassion and mercy; we ourselves are healed of the weight of our own fears! God does not expect us to be perfect; God just asks us to be open to being perfected. How are we perfected? Through the movements of compassion and mercy. Christ the Messiah and Gentle Shepherd continues to gather the isolated and the outcast through healing and through mercy. The “outcasts” here being both others and our very selves. In imagery and description the virtue of hope is a play between tensions. Hope moves one into the future – “Hope is the theological virtue by which we desire the kingdom of heaven and eternal life as our happiness, placing out trust in Christ’s promises and relying not on our own strength, but on the help of the grace of the Holy Spirit.” (CCC #1817) – yet hope is often symbolized as an anchor – “Hope is the ‘sure and steadfast anchor of the soul … that enters … where Jesus has gone as a forerunner on our behalf.’” (CCC #1820) This play of tensions reveals the always dynamic quality of true hope and also why hope always eludes a static definition. It seems that it is the very nature of hope to remain unbounded. The yearning is within us and the answer to that deepest yearning of the human heart is found without in that which is so much more than any one individual and that to which all creation is moving – the very Kingdom of God. Due to this the theological virtue of hope fulfills our deepest individual yearning yet does so in a way that connects us to one another and to all creation. A “hope” that would separate and divide is, in fact, a false hope. 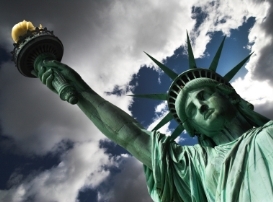 True hope also respects freedom. It cannot but respect freedom in order to be true to itself. I am now a priest of seventeen years and I have served in a variety of settings and I must admit that I have never before been in a setting (college campus ministry for five years) where people and groups are so intent on forming other persons in their own image while at the same time there is so much talk of “respect for free thought” and “being yourself”. Why is it that “being yourself” means you have to look and act like everyone else? This is across the board: social groups, academic groups and settings, religious groups, opposed to religion groups, whatever. There is this overwhelming push it seems to form others in one’s own image and this can be subtle or just outright blatant and manipulative in nature. In this context, if a group does not seek to form others in its own image and has developed the maturity to respect freedom then it is written off as just naïve, out of touch at best or questionable and even suspect at worse. But true hope respects freedom. It must. This is why any form of totalitarianism (and there are many) that would restrict freedom and conscience, sometimes under the seemingly most benign and even most “positive” of reasons, in fact, ends up suppressing hope. Yet even though hope can be wounded it can never fully be lost because the author of hope is God himself. If hope can be suppressed (but never fully lost) then it can also be cultivated in one’s life. How might we cultivate the ground of our lives in such a way that hope might come to dwell within us? Our faith gives some strong advice: turn to God and develop a relationship with him in both prayer and sacrament, avoid sin and evil, if one has sinned ask for mercy and pardon (i.e. the sacrament of reconciliation), get out of yourself and strive to live in harmony with others and even go beyond just that to specifically doing good for others and serving others – especially the poor and even those who oppose you, live in a community which supports and strives for all of the above mentioned, i.e. the Catholic Church. Our own actions and also the actions of others upon us (both positive and negative) can either cultivate our life for hope or turn us further away from the possibility of hope. In this regard our choices and the choices of others do have effects and do carry consequences. 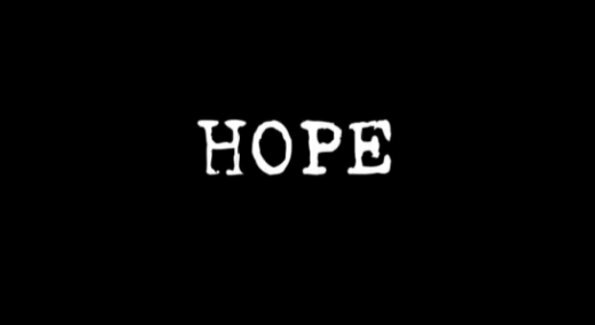 Hope is truly beautiful and when it is authentically found in the life of a person it does speak to the souls and deep yearning of others. In the person of hope we know that there is just something there that we ourselves are searching for. On January 20, 2012 the U.S. Department of Health and Human Services reaffirmed a rule that under the new health care law, virtually all private health care plans must cover sterilization, abortifacients, and contraception. The rule is set to take effect August 1, 2012. Non-profit religious employers that do not now provide such coverage, and are not exempt under the rule’s extremely narrow definition of religious employer, will be given one year to comply. One commentator noted that even Jesus and his disciples would not fall under the rule’s narrow definition of what accounts for a “religious employer”. This ruling will force Catholic hospitals, universities and charity organizations that have historically provided immeasurable service to our society (especially to the poorest and most vulnerable) to provide this coverage for its employees even as it contradicts firmly held beliefs about the dignity of life and morality that these institutions are founded upon. This is why this mandate matters to Catholics. Why should the mandate matter to others? People of goodwill may not agree with the Catholic Church’s teachings on when life begins or about the purpose of the sexual union of man and woman but the mandate to violate ones conscience should give everyone pause. One of the core beliefs that our nation is founded upon is the free exercise of religion and the right of men and women to live as their conscience determines. In May, 2011 Francis Cardinal George, O.M.I. of Chicago published a book entitled, “God in Action: How Faith in God Can Address the Challenges of the World.” I would like to share a few quotes from this book that in many ways are proving to be quite prophetic. Public life, from a secularist point of view, must be constructed on the assumption that God does not exist or, if he does, that his existence makes no difference. Secularism’s espousal of public atheism in this country is based not on racial superiority, as was the case in Nazi Germany, or on supposedly scientific history of class warfare, as was the case with Leninist states, but on the myth of human progress carried exclusively by a scientific method limited to the study of material reality. This project occupies the entire ground of public human action and public discourse in the pursuit of truth. Freedom of religion extends beyond freedom of personal conscience and beyond freedom to worship. It includes freedom for religious institutions to have a public voice, to be public actors. When secular life is constituted without respect for religious freedom, it becomes profane, and persecution of religion becomes inevitable. There is no guarantee that even democratic institutions will prevent this outcome. Independent courts, a free press, an elected legislature can all be manipulated, and have been in our own history, to subvert various freedoms and reflect the prejudices of controlling interest groups as well as those of ordinary citizens. A government that determines what is a religious ministry and what is not, what is the nature of an institution such as marriage, which predates both Church and state and is the creature of neither, when human life begins and when it can be taken without a penal trial has exceeded the boundaries of limited governance and is already on the road to totalitarianism. While democratic in form, it has betrayed human freedom. Some have referred to the recent HHS mandate as the “Obama administration’s war on the Catholic Church”. I do not believe I would go that far and I think it wise to avoid such inflammatory and specific language which can make it seem like this is just a Catholic issue when it, in fact, carries truly important ramifications for everyone in our society. Yes, Catholics, all Christians and all religious persons need to be concerned about this mandate but so do all Americans. It is a First Amendment issue. I respect the good that the Obama administration has achieved in very turbulent times and I am sure, that there are ways that the Church and the administration can work together for the common good. But I would also say that it is exactly in turbulent times that we need to hold to our core principles rather than abandon them. I do not see the administration as so much intentionally opposed to religion as just more secularist in outlook and, I would say, a specific understanding of secularism that just does not “get” religion and therefore, knowingly or unknowingly, seeking to bracket religion off and leave it out of the equation. Elsewhere in his book, Cardinal George (building on the thought of Bl. John Paul II) proposes an understanding of secularism as “the ground between the sacred and the profane” (“profane” here being used not in a negative, pejorative context but as that distinct from the purely sacred). Proper secularism does not necessarily have to be held in opposition to the sacred and it is an injustice to both when it is solely understood this way. Secularism can actually be the ground where religious thought and non-religious thought encounter, dialogue and mutually enhance one another. I remember being struck by a news clip I saw of the White House Christmas celebration and President Obama remarking how the Christmas “story” has inspired people throughout the centuries. Now, Mr. Obama is our president and I respect him for that and he is a politician who knows how to choose words that appeal to a vast variety of people while not offending but I would beg to differ here with the president. It is not a “story” that is at the core of my life and the purpose of my life; it is a continuing encounter I have with the living God who refuses to be controlled or locked away. A secularism that seeks to bracket off the sacred just does not get this and that is a sad thing and it does not bode well for the future. Due to the reasons shared above, the HHS mandate does matter to everyone and to who we are as a nation and to what we say our core principles are. I encourage everyone to truly reflect and weigh out the consequences of this mandate. I encourage people to work to overturn this mandate and to respect the right of conscience.